On a shimmering summer day, four people park a landscaping vehicle – name and logo emblazoned on the side – outside a residence. Two, clothed in matching shirts, busily mow the grass and neatly trim the edges. The others empty the home’s valuables. Within 15 minutes, they’re gone. Neighbours had seen the perpetrators and assumed they were hired contractors. Several ruefully admired the manicured lawn. That’s one brazen bunch of burglars. It’s also a story that neatly contradicts the misleading image of typical burglars: clothed in dark and concealing attire, they strike on a chill night through the back door. In fact, most dress like ordinary folks and stroll through the front door – unlocked windows are favorite entry points, too – between 10 a.m. and 3 p.m., when adults and children are likely elsewhere. It’s a smart strategy for successful crimes, because the noise and activity – not to mention sleeping residents – of nocturnal break-ins are much more likely to arouse neighbourly suspicion and attract law enforcement. Further, July and August are the two months that burglars favour, because homeowners leave windows or doors ajar, granting easy access. Simply put, experienced thieves look for easy daytime targets in warm weather. But there are tactics you can deploy immediately that make your home harder to burglarize at any time of year. First, always lock doors and windows, even if you’ll be gone for a short time. Because most thefts are completed in a few minutes, it doesn’t take long for an experienced thief – who experts say heads for the master bedroom first – to remove valuables. Second, get to know your neighbours and clue them into who is welcome at your home and who isn’t. Let them know which services will care for your property and when they’re expected. Third, try to vary your routine. 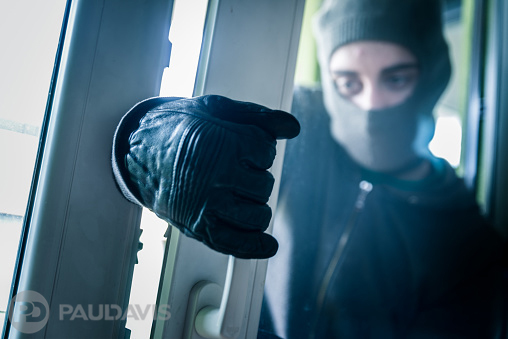 Surprisingly, many burglars live within three kilometers of the properties they break into, giving them plenty of time to study your habits and plan their criminal visit.